Intel first launched their Optane range of storage solutions around a year ago, utilising the 3D XPoint memory within a typical consumer product for the first time; these drives arrived with capacities of 16GB and 32GB, with the main usage scenario being a cache drive for much larger spinning drives. Today we look at the Optane 800p, first mentioned at the start of March, available in 58GB and 118GB with improved speeds to boot; aimed as stand-alone boot drives, with enough room for a Windows 10 install and some essential applications. Unlike almost every other NVMe solution on the market currently, the Optane 800p uses 3D XPoint memory, instead of 3D NAND. The main advantages of Intel’s 3D XPoint are that latency is hugely reduced compared to NAND, and density is increased by stacking the cells within the memory chips. Absolute throughput isn’t a strong suit of the 800p, offering read and write speeds of 1450MB/s and 640MB/s. 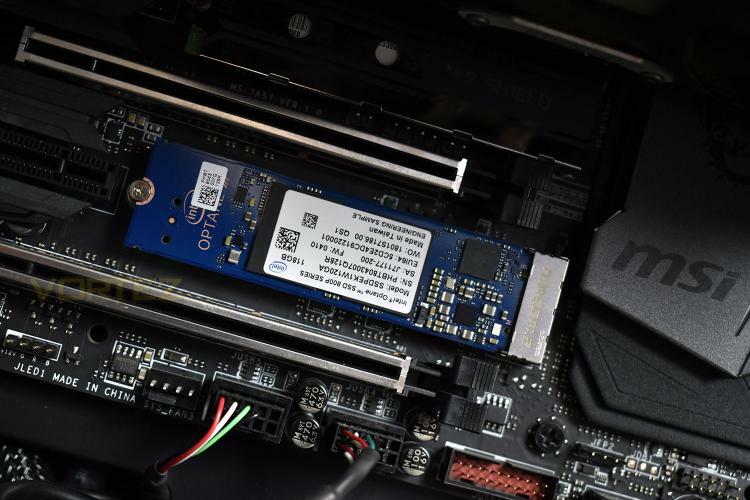 Compare that to Samsung’s fastest drive, the 960 Pro which pushes out 3500MB/s and 2100MB/s, the gains have to be made elsewhere – Intel seemingly have targeted a much more balanced SSD, aiming for quicker access instead of overall bandwidth. The biggest hurdle Intel will face in marketing the 800p series of Optane SSDs is price. Currently, NVMe solutions from other manufacturers can be found at around the 2.5GB/£1 mark; compare that to Intel’s 0.8GB/£1 on the 118GB model and the difference is as clear as day. Not only is price an issue, the small capacities are also a problem – gone are the days of 64GB SSDs, with 128GB seemingly not too far behind; so do 58GB and 118GB SSDs make sense in today’s market? Certainly, there will be some frugal users who can take full advantage of a small SSD, but why wouldn’t you spend that same money on something two, or even three times the capacity at the same price? Let’s have a look at some figures and work this out.